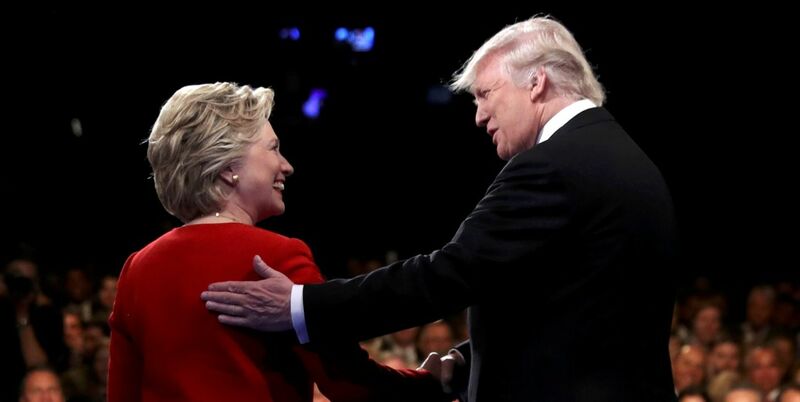 WASHINGTON (CNS) — Catholics are giving a decided edge to Hillary Clinton, as she has a 5-to-4 margin over Donald Trump, according to a new poll released Oct. 31 at a news conference at the National Press Club. Hispanic Catholics and white women are helping Clinton make these gains, said the poll results, released by the Public Religion Research Institute in conjunction with the Institute for Policy Research & Catholic Studies at The Catholic University of America in Washington. Clinton, the Democratic nominee, got support from 51 percent of Catholics compared to 40 percent for Donald Trump, the Republican nominee. This compares to a much closer 50 percent-48 percent advantage Catholics gave to President Barack Obama over GOP challenger Mitt Romney four years ago in Obama’s re-election bid. White Catholics prefer Trump by a plurality of 48 percent to 41 percent. But nonwhite Catholics give Clinton a 78 percent-17 percent boost, said Robert Jones, PRRI president, during the news conference. By comparison, Romney carried white Catholics by 18 percentage points in 2012, but lost to Hispanic Catholics by 54 percentage points. That Republicans are trailing so badly among Hispanics should come as no surprise, said Maria Teresa Kumar, founding president of Voto Latino, when in 2012 “you talk self-deportation” — a Romney position on immigration — and in 2016 “you’re talking about their families … and then you start talking about building a wall.” Trump made headlines on the campaign trail with his remarks that immigrants who are entering the country without legal permission are “bringing drugs, they’re bringing crime, they’re rapists,” and about building a wall to stop such border crossings and make Mexico pay for it. Many immigrants, Kumar said, live in “mixed status families” — some with legal status, others without legal status, others are citizens, including the U.S.-born children of immigrants in the U.S. without documentation — and 51 percent of what she called the nation’s “population boom” are the children of immigrants. Jones said white Catholics’ overall support for Trump did not vary much by age, as Catholics ages 18-49 favored him 49 percent to 40 percent for Clinton, while those 50 and over chose Trump 47 percent to 41 percent for Clinton. He attributed the lack of difference to the church’s “loss of the young people, who are generally more liberal.” Jones said this trend also can be spotted among white evangelical Christians. The bigger difference, according to the poll, comes in gender. White Catholic men back Trump 58 percent to 33 percent for Hillary, but white Catholic women support Clinton 49 percent with 38 percent for Trump. “A gender gap in vote preference is evident across religious groups,” said the poll, titled “The 2016 Religion Vote.” But “white Catholic voters have a much more pronounced gender gap,” it said. There is a gender gap among Hispanics who vote, according to Kumar. In the last presidential election, 51 percent of Hispanic women voted, she said, but only 39 percent of Hispanic men did. The numbers for this new poll were aggregated from four separate PRRI polls conducted Sept. 22-Oct. 17. The time frame includes the leaking by NBC of a recording of lewd comments made by Trump off camera in 2005 that were picked up by a “hot mic” before a TV interview. The time period does not include the third presidential debate or the FBI announcement Oct. 28 that it was conducting a further investigation into Clinton’s emails being on an unauthorized computer when she was secretary of state. Catholics make up a bit over one-fifth of the electorate. However, their numbers are stronger in Pennsylvania and Wisconsin, where they are about one-third of all voters, Dionne said. Catholics also make up about one-fourth of all voters in Florida, Arizona, Nevada and Ohio. All of these states were being hotly contested in the campaign’s final days. Jones showed a pie chart in his presentation dividing Catholics into three roughly equal parts: “intentional Catholics” who go to church weekly and tilt Republican; “cultural Catholics” who go to church less often and lean Democratic; and Latino Catholics, whose “slice” of the pie in the chart was the largest of the three. Dionne, though, broke it down into “social renewal Catholics” for whom life issues are paramount and “social justice Catholics” who focus more on Catholic social teaching. The differences are real, he said. “You see this right at the parish level all over the country. There are differences” in how the Gospel mandate is interpreted, Dionne added. “Ideology trumps religion. Ideology trumps faith,” he declared. To illustrate Dionne’s point, Jones cited result from a PRRI survey released Oct. 26, “The Divide Over America’s Future: 1950 or 2050?” Respondents were asked, “Since the 1950s, do you think American culture and way of life has mostly changed for the better, or has it mostly changed for the worse?” Sixty-five percent of Hispanic Catholics replied it had mostly changed for the better, but 57 percent of white Catholics said it had mostly changed for the worse. Priests, Rabbis and Ministers should never promote one candidate over another, from the pulpit or lectern. They may speak to the issues. However, if the issue that most concerns a cleric is “Pro life,” how “pro life,” is someone who supports the death penalty, or states that he will “carpet bomb” the Middle East, killing hundreds of thousands of innocent civilians, in order to eliminate ISIS cells? People would be wise to beware when it comes to whom they support. What Christian could vote for Trump? IS anyone more unChristlike than Trump? Hillary….she has shown time and again her disdain for Catholics and we have proof from the wiki leaks. No Catholic in good conscience could vote for her. A sad commentary and not enough pro-life support from the pulpit . Doc, if this means that you are a Trump supporter, ask yourself, how pro life is the death penalty, which Trump advocates? How pro life is it to carpet bomb the entire Middle East to get ISIS? To do so would kill tens of thousands of innocent civilians. Is it really pro life to disrespect African Americans, Jews, Latinos, Muslims, Asians, the LBGT community and women because of their ethnicity, race, color of their skin, gender or gender orientation?